Thinking of starting a science blog, but not sure where to start? You’ve come to the right place. 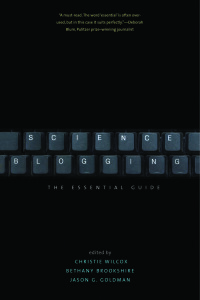 Below, we have included brief summaries of each chapter for the beginning science blogger, and a list of online resources that can help readers get started and develop their social media skills. In the first chapter of Science Blogging: The Essential Guide, editor Christie Wilcox asks you to consider why you want to blog. What do you have to gain from writing about science on the Internet? Perhaps you want to help share the wonders of science with the public. Perhaps you want to enhance your resume or network more widely. No matter your motivation, Christie offers insight into the pros and cons of starting a blog or engaging in social media. While blogging might seem a selfless act at first, it opens the door to real career-enhancing opportunities, whether that means broadening your professional network, increasing your exposure, or simpling making you more marketable through new and enhanced skills. You can even end up making money off of it, though I wouldn’t recommend getting into science blogging for the cash. Blog because you like to communicate, and because you have a passion for scientific topics that need someone like you to convey them. Blog to gain exposure and network, and to expand your career. Did Rosie Redfield Just Refute #areseniclife on Her Blog? The Internet is young, and science blogging is younger still. But for all that, it has a fascinating history. Chapter author Carl Zimmer has been involved in science blogging almost since the beginning. He authors The Loom at National Geographic’s Phenomena Blogs, maintains a column at The New York Times, is a national correspondent at Stat, and has written a number of science books. He discusses the twists, turns, and speedy expansion of the science blogosphere, and speculates on what is to come. Today, things have changed far beyond what I could have imagined when I started out in journalism. From 1950 to 2000, American newspapers tripled their revenue from advertising, to $48 billion a year. Since then, revenue has crashed to $22 billion—a level not seen since 1950…. Science blogging, I would argue, has become so mainstream that the term is becoming obsolete. What Effect Has the Internet Had on Journalism? You’re going to do it. You’re going to start a science blog. But where do you begin? There are several options open to the person wanting to set up their own corner of the Internet. Chapter author Khalil A. Cassimally, the community coordinator at The Conversation, will guide you step by step through the pros and cons of Blogger, WordPress, Tumblr, and more. Once you get in the habit of blogging, you will find it easier to keep going. The creativity floodgates of your mind are open and ideas for future posts will randomly but frequently pop up. Keep a note of those ideas so that you can explore them later on. Your developing audience will also motivate you to write with their constructive comments and indicators of approval, such as Facebook likes, Google +1s, and Twitter retweets. Images can help bring a written piece to life. But many people use images improperly, without attribution—a habit that robs artists of their hard work and livelihood. The best science communicators will take care to use photos and art responsibly and with permissions. Chapter author and science artist Glendon Mellow of The Flying Trilobite and Symbiartic will help you understand how to attribute images so that everyone benefits, and how to pick the best images to accompany your message. If you see an image that would be just perfect for your blog post, remember that you can reach someone on the other side of the planet more easily than ever before. Make contact on Twitter or a blog comment or via their page on DeviantArt, an online social communicate for artists. Try email for a formal touch. Simply explain why you think the image is effective and how you would love to include in on your blog post for outreach or education. See what happens. When setting up a blog for the first time, you may have an opportunity to do so in a blog network. Some are run independently, while others are affiliated with magazines, scientific journals, newspapers or other media outlets. There are pros and cons to being in a network. Chapter author Danielle N. Lee, a postdoctoral researcher at Cornell University and a blogger at Scientific American Blogs’ The Urban Scientist, runs through some of the things to consider when fielding an offer from a network. Is it worth joining a blog network? That depends on the goals and strengths of your blog. It is worth a pause if absolute freedom is important to you. Although most networks large and small assure bloggers that they will have autonomy, blog posts can be removed or altered by the network editor. It is worth considering whether you are interested in the increased exposure for your work that comes with joining a network, and whether you would rather focus more on your content (and other real life science activities) than on managing the blog’s logistics and acquiring traffic. While many science writers these days prefer to set up blogs on a well-known network or site, many scientist bloggers prefer an independent existence. This comes with complete editorial freedom, but it also comes with its own challenges. Chapter author Zen Faulkes is a professor of biology at the University of Texas Pan American and maintains three independent blogs, including the Better Posters blog and Neurodojo. He shares how he makes the independent, ‘Ronin’ existence work for him. There are advantages to belonging to a network, but they may not be as great as you think. There is a certain visibility that comes with a network, but being on a network in and of itself does not guarantee readership. Ultimately, networks function best when they create and facilitate communities. To the extent that I have been successful as a blogger – whether measured in page views or that people know who I am and what I do – part of that success is because I embraced the social nature of the blogosphere. I worked to join existing communities. Blogging started with with long, essay-like stretches of words on a single page. Many blogs still hold to this format. But others have embraced the power of shortform on platforms like Tumblr. These blogs may not look like traditional blogs, but they have the power to reach a new and vastly different audience. Joe Hanson, the mind behind the popular Tumblr and YouTube series It’s Okay To Be Smart, explains just how much microblogging can add to the science communication universe. On its own, a microblog isn’t best suited for carrying out a broad, institutional science communication effort. But they can be important parts of those larger efforts, useful tools for doing a very particular kind of science communication directed at a very particular audience. Current users of microblog platforms are young, spend a lot of time online, are well-educated, and are fairly evenly split between males and females. Tumblr holds a reputation for engaging groups typically underrepresented in science, especially women, racial minorities, and people identifying as LGBTQ. Tumblr users are the proverbial “key demographic,” that is, replete with important science fandoms waiting to be noticed. Before the Federal Communications Commission in the Matter of Protecting and Promoting the Open Internet, Comments of Tumblr, Inc. Many science writers feel at ease writing about medical, environmental, or biological topics. For these writers, entering the world of physics, math, and engineering can seem like a daunting task. And on the Internet, where fact-checkers are often absent and misinformation abounds, it can seem almost impossible. But don’t let the hard sciences fool you. Rhett Allain, a physics professor at Southeastern Louisiana University and blogger at Wired, explains how blogging can be a boon to the hard sciences. Where do you get ideas for blog posts? If you’re like me, you answer questions that you have yourself. When I see something in the news that looks interesting and physics-related—which isn’t difficult given that just about everything that moves or is powered by electricity is connected to a physics concept—I will make that into a blog post. Sometimes, too, it will be a question that someone else asked. For instance, someone asked why the moon doesn’t crash into the Earth even though the Earth pulls on the moon. That’s a great question. It is fun to try and explain these things in a way that large numbers of people can understand. How Does Gollum See in the Dark? Why do Astronauts Float around in Space? Eagle Picks up a Kid: Real or Fake? Who’s Faster? Flash or Quicksilver? Why Doesn’t the Moon Crash into the Earth? Perhaps you’ve decided to start a blog after all. You’ve got it up and running. Now what? Check out the resources from some of our other chapters, which will help you learn how to find your voice and take it to the next level.